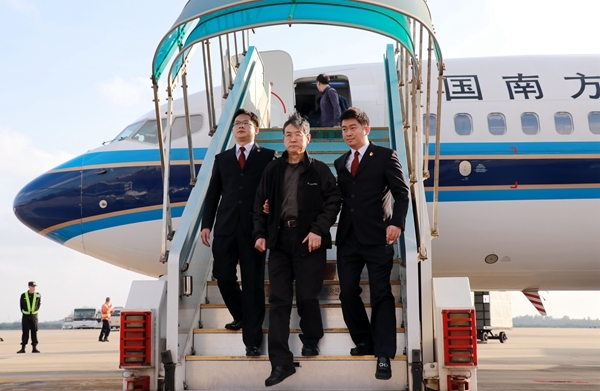 Wang Junwen, a fugitive suspected of taking bribes who fled overseas in 2003, returned to China Tuesday to hand himself in to authorities, China's top anti-graft authority announced Wednesday. Wang, 67, was a former senior Party official at Hainan provincial economic cooperation department and former head of a state-owned enterprise in the province, according to a statement by the Communist Party of China Central Commission for Discipline Inspection and the National Supervisory Commission. He is the sixth fugitive to return to China and turn himself in after an office in charge of fugitive repatriation and asset recovery under China's central anti-corruption coordination group released evidence related to 50 fugitives. The statement said Wang was cooperating in returning his illegal gains.